President François Hollande assured everybody when he came into power two years ago that French tax income would increase if he dramatically raised income, corporate and sales taxes. 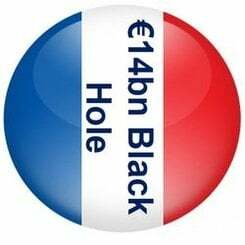 He did so, and now the Court of Auditors (Cours de comptes), which oversees the government’s accounts, says there is a gaping €14 billion ($19.04 billion) black hole in its public finances. “At €284 billion, tax revenues are up for the fourth consecutive year. Their €15.6 billion increase is mainly the result of new measures. Despite this increase, they were down by € 14.6 billion compared with what was forecast.” (“Avec un montant de 284 Md€, les recettes fiscales sont en hausse pour la quatrième année consécutive. Leur augmentation de 15,6 Md€ résulte pour l’essentiel de mesures nouvelles. En dépit de cette augmentation, elles sont en retrait de 14,6 Md€ par rapport à la prévision inscrite en LFI.”). Hollande raised the top rate of income tax to 75% in 2013, which resulted in the emigration of a number of well-known French citizens, including actor Gerard Depardieu. French taxes, which are equivalent to approximately 46% of GDP, are the highest among the Eurozone nations. The Elysee Palace forecast €30bn in extra tax revenue, but only €16bn additional income was collected in 2013. According to Hollande’s estimate, the higher rates would raise French tax income by €30 billion in 2013. The Court of Auditors reported that the extra amounted to just €16 billion, slightly over half of what Hollande had predicted. In fact, the Court of Auditors said Hollande’s team was “wildly inaccurate”, and it wonders about this year’s forecast. The forecast for 2013 was based on skewed projections and as well as being overly-optimistic, it added. Ever since coming to power, the French president has cut spending across the board and raised taxes. In the opinion polls he has been below 20% for several months. The President’s Socialist party performance in the European Parliamentary elections on Sunday was a disaster. It came third with 14% of the vote, behind Nicolas Sarkozy’s UMP with 20%, and the ultra-right wing, anti-euro National Front with 25%. Critics and a growing number of independent voters blame his policies for undermining the country’s chances of a sustained economic rebound. In the first quarter of 2014, French GDP registered zero growth, due to poor business investment and weak consumer spending. GDP would have shrunk had it not been for public spending. France’s statistical agency, INSEE, said French GDP leveled off after a slight increase of 0.2% in the last quarter of 2013. INSEE reported today that household consumption expenditure on goods declined by -0.3% in April, after increasing by 0.6% in March. April’s fall was mainly due to reduced expenditure on energy products (-3.3%). After a meeting with European leaders in Brussels on Tuesday. Mr. Hollande rejected suggestions that the pace of deficit reduction should be slowed. The deficit was 4.2% of GDP in 2013, compared to 4.8% in 2012. Hollande said there can be no delays. “We can’t live with such heavy debt…with deficits,” he stressed.